Laois residents who fear for their lives on a dangerous stretch of the N80 road, are considering blocking it with tractors to force safety measures. Two farmers from Stradbally in fear of traffic at the Carlow side of the village, are prepared to do a tractor blockade. “Our only option is to get out with the tractors. We are prepared to do it,” said farmer Martin Walsh. “In Portarlington people got out on the road and protested and they got the job done. We are flogging a dead horse here,” he said. Below: the N80 approach road into Stradbally past Oughaval cemetery. There have been “hundreds of accidents” at the location, Tom Scully told the Leinster Express. “We have young women with grandchildren who are afraid in their cars. We are taking our life in our hands on that road. Do we have to wait until someone important is killed before something is done?,” Mr Scully asked. He said his cars have been hit “three or four times”. “The speed limit display is in the red every time a car goes by. We are fighting three years for this, Laois County Council seem to have no will to do anything,” he said. Three months ago a car driving from Ballylinan went out of control and landed in a field he said. “A motorbike rider was killed five years ago. The P&T are putting up poles every six months,” he said. “If I am going to Carlow, I have to drive down to Stradbally to turn back around. It’s too dangerous to turn right onto the road,” he said. He said there is “oceans of space” to install safety measures. “It would have a big effect on the town,” he said. They are angry that there is no footpath to Oughaval cemetery from Stradbally. “It is a disgrace there is not a path,” said Mr Walsh. They were among many resident who attended a meeting to highlight traffic concerns in Stradbally this February. 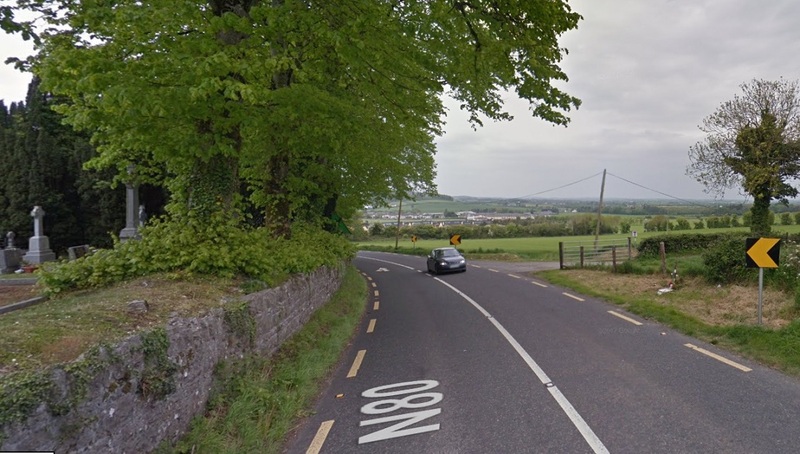 They want Laois County Council and Transport Infrastructure Ireland to install traffic slowing measures on the N80 throughout the village, starting at the Oughaval side. Cllrs Paschal McEvoy and Tom Mulhall heard their concerns and agreed to again raise them with the local authority.